L-R: Jocelyn Peterman, Brett Gallant. 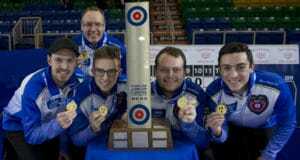 Missing, national coaches Jeff Stoughton and Scott Pfeifer. 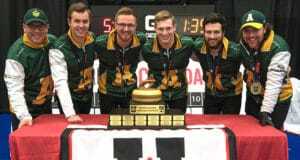 Front, from left, skip Kevin Koe, vice-skip B.J. Neufeld, second Colton Flasch, lead Ben Hebert. Back, team coach John Dunn, alternate Ted Appeman. 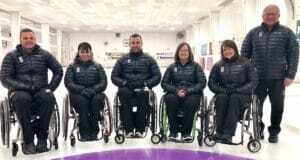 Missing, national coach Jeff Stoughton. L-R: Skip Chelsea Carey, vice-skip Sarah Wilkes, team coach Dan Carey, second Dana Ferguson, lead Rachel Brown. Missing, alternate Jill Officer, national coach Elaine Dagg-Jackson. L-R: Mark Ideson, Collinda Joseph, Jon Thurston, Marie Wright, Ina Forrest, coach Wayne Kiel. 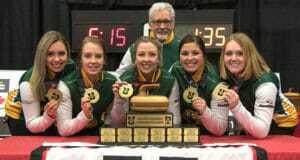 L-R: Skip Kristen Streifel, vice-skip Danielle Schmiemann, second Selena Sturmay, coach Garry Coderre, lead Jesse Iles, alternate Paige Papley. L-R: Skip Tyler Tardi, coach Paul Tardi, vice-skip Sterling Middleton, second Matt Hall, lead Alex Horvath. 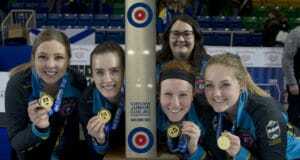 L-R: Skip Selena Sturmay, vice-skip Abby Marks, second Kate Goodhelpsen, coach Amanda-Dawn St. Laurent, lead Paige Papley. 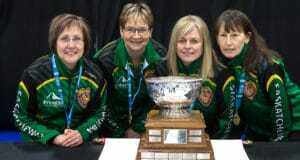 L-R: lead Anita Silvernagle, skip Sherry Anderson, vice-skip Patty Hersikorn, second Brenda Goertzen. Missing, coach Bill Tschirhart.